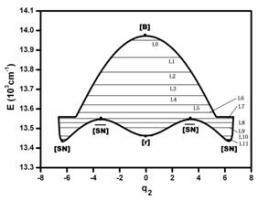 The concepts of classical nonlinear dynamics are employed to interpret the spectroscopic properties of molecular highly excited vibration. An algebraic Hamiltonian is employed for the dynamical analysis from which the dynamical potential can be easily obtained. The dynamical potential is closely related to the classical fixed points in which the quantized levels are embedded in various quantal environments. Localized modes are easily identified in various systems which share similar dynamical potentials. The dissociation of deuterated formyl radical is finally interpreted by these concepts from the classical nonlinear dynamics.